This delicious Fluffy Vanilla Buttercream Frosting is crusting recipe that is perfect for cake decorating! This American Buttercream is similar to our Classic Vanilla Buttercream recipe, however, it has a lighter, fluffier texture due to the shortening in the recipe. What is a crusting buttercream? As the name suggests, crusting frostings like this one develop a very thin crust when exposed to air. In as little as 5-10 minutes, a cake frosted in a crusting buttercream can be lightly touched without removing any of the frosting. Beneath that thin layer, the frosting remains soft. Many cake decorators love to use the “Viva Paper Towel method” of smoothing when working with crusting buttercreams. Simply frost the cake, sweep around the sides and top with your spatula (or bench scraper) of choice, and then allow it to sit for a few minutes before smoothing over it with a paper towel. You can find more information on this method of smoothing here: Leopard Print Buttercream (using the Viva Paper Towel Method). 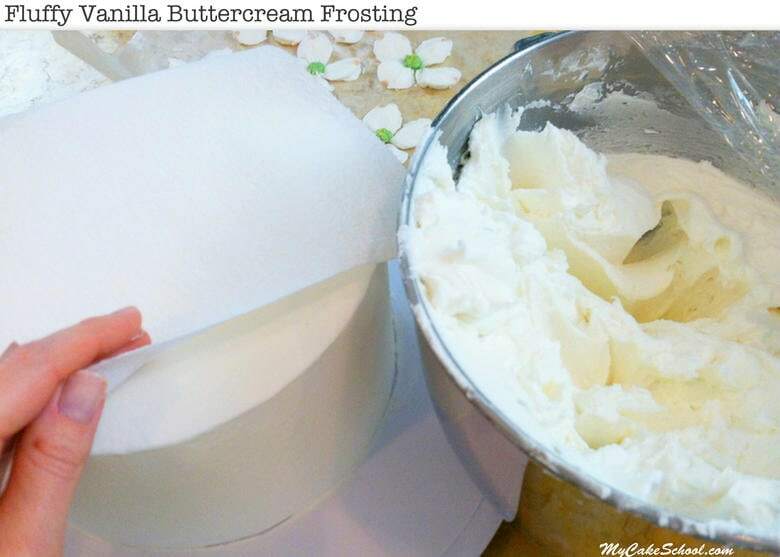 This Fluffy Vanilla Buttercream frosting contains both butter and shortening. Because of the shortening, it is slightly more heat resistant than an all-butter frosting recipe, and it is lighter in color than an all-butter buttercream recipe. If heat is more of a concern, you could switch to an all shortening (no butter) frosting recipe like this one: High Ratio Frosting. All frostings will melt if the weather is hot enough, but shortening certainly is more resistant than butter. If you are looking for a crusting frosting that does not contain any shortening, we love our Classic Vanilla Buttercream recipe also. You can find it here! : Classic Vanilla Buttercream. We often use clear vanilla in our buttercream frosting recipes because real vanilla gives vanilla buttercream more of an off-white or ivory color. However, this may not bother you! It simply comes down to personal preference or the design of your cake. ** Important note about the sugar: We’ve had great results with Domino’s confectioners sugar and US Sugar (we buy ours from Costco). Some brands of confectioners sugar don’t work as well with buttercream frosting recipes. If a package doesn’t say pure cane sugar, it contains beet sugar which is more likely to give you a grainy outcome. This fluffy vanilla buttercream recipe is perfect for piping and works great with the viva paper towel method! Good flavor, and contains shortening which makes is a bit more heat resistant. 1/2 teaspoon salt to cut the sweetness. We use popcorn salt because of its fine grain. If using table salt, you can dissolve it in the milk before adding. Cream butter, shortening , salt and extracts until creamy and smooth. Add powdered sugar and milk. Mix thoroughly on medium speed for approximately 8 minutes. For the last two minutes decrease the mixing speed to VERY SLOW ( number 2 speed on a KitchenAid) until creamy and smooth. Scrape the sides of the bowl occasionally during the mixing process. *If I use a high ratio shortening (such as CK or Sweetex brand) I decrease the shortening amount to 1 1/4 cups (236 g.) and increase the milk, 1/4 cup plus 2 to 3 Tablespoons milk or enough to make it the consistency you like. *I used to always use water for this recipe, but I switched to milk for flavor & also because when you use a higher fat milk for your liquid, the buttercream still has a nice crust to it, but it doesn't crust quite so quickly or so hard as if you use water. Thanks for stopping by! Don’t forget to check out our entire collection of favorite cake and frosting recipes in our Recipes Section! If you are interested in learning more about cake decorating, don’t miss our Free Cake Tutorials section. Or, for full online access to every cake decorating video tutorial that we’ve made, you should consider becoming a member of My Cake School! Has anyone else noticed in the ingredients that there is one listed as 1/2 teaspoon but teaspoon of what isn’t put on there. Now I’m assuming since you begin talking about popcorn salt that this is suppose to be 1/2 teaspoon salt but the actual ingredient isn’t listed in the ingredients. Hi Pamela, Yes, it should read salt. Thanks for letting us know, I have made the correction. I just made this recipe with the hi ratio shortening and it really is delicious and fluffy! I wish you would add how to store and for how long in fridge or freezer to the instruction part. I feel like I spend so much time reading thru the comments to find how long this will keep. My question is…today is sunday and will be frosting my cakes on friday. Should I keep this in freezer till Thursday or should I keep it in the fridge? How long will this keep in freezer and in fridge. Hi Ansa, If the butter and milk used in the recipe are not near their expiration date, it will be fine to keep the frosting in the refrigerator. We have frozen frosting for 2 months with no problem. Whether you refrigerated or freeze, once it comes to room temperature you will need to stir or remix to fluff it up a bit before frosting your cake. Hi, How many batches of this icing will I need to frost a 2 layer 8″ cake? Hi Gloria, The recipe makes 6 cups frosting. You need approximately 4 cups to frost a 2 layer 8 inch cake. The recipe will give you extra frosting for any decorative piping you might want to do. I want to let you know that on the home page of the site, you will see the Member Resources Heading on the right side of the screen. Click on Select a Page and you will find the Wilton Serving Chart that gives batter and frosting amounts. This will help you get a quick answer in the future. My icing is crumbling before I get it all applied. Does it need more liquid? Hello, I have two questions, did you use a flat beater or the whisk beater for this recipe? Also, my son is allergic to nuts. Can I use the almond extract? Hi Debbie, We use the flat beater for this recipe. The almond extract is an optional ingredient so you can leave it out with no problem. Hi Melissa and Be Be, I was wondering if I could substitute lemon juice for the milk? I’m going to use this for your palette knife technique and since I am a cottage food operator I can’t use mil. And I’m using your doctored lemon cake. It will be decorated tomorrow but won’t be at the event until Sunday. Thanks so much!! Hi Terri, We have found that lemon juice does not give us the lemon flavor that lemon extract does. I recommend using 2 teaspoons lemon extract and no vanilla extract for a lemon buttercream. You could use water as needed instead of milk in the recipe. Adding the zest of 1 lemon also adds more lemon flavor. Using a microplane is the best way to zest. Using water instead of milk does cause the buttercream to crust more quickly, so keep that in mind because you may need to work more quickly in case you are going to smooth the frosting using the Viva towel method. Below is a link to our Lemon Buttercream recipe in case you would like to adapt it to your needs. Hope all goes well. Hello! Would you recommend this icing, all butter buttercream or hi-ratio icing for flowers? I am doing a cupcake bouquet for 03/29. Thanks!